Is beige the new green? What was the hospital chef/nutritionist thinking when planning this meal? If you were not unwell before you clapped eyes on this meal tray the sight of us would make you so. Surely, this is not necessary – and must be a one-off? This entry was posted in brain food and tagged beige food, hospital food, is beige the new green?. Bookmark the permalink. Shocker! Whatever happened to eating brightly coloured foods, as many different ones as possible in order to stay healthy! Must say both times I was in hospital having babies I got friends/family to bring food in for me. Now I know why! I know … a friend who is in hospital sent me this picture. Could not resist sharing it! It has transpired that you are best off asking for a vegetarian or halal meal: more care seems to be taken over “special” meals. I’d like to think this all beige meal is a one-off example of particularly poor menu planning. Surely, hospital food should be the most nutritious, freshest food, tempting food you can get, designed to nourish + heal and without making too many demands on the digestive system? Didn’t Lloyd Grosman spearhead a campaign (recently?) to revitalise hospital food? 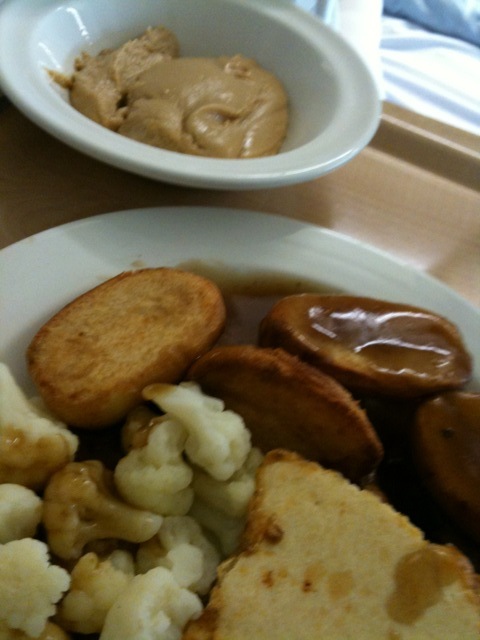 sadly the other western meal I selected whilst in hospital for 5 days was magnolia and inedible. I learnt (a bit like airlines) to order the halal or kosher options as these were tastier and milticoloured. I think it makes very depressing viewing – these hospital meals! I really thought that last week’s beige meal was simply a one-off, but sadly judging by this fricassee it’s not. Even given the logistics + budgetary restrictions that no doubt apply, with a little bit of knowlegde, care + imagination, meals could be a whole lot more appetising (and nutritious) than this.